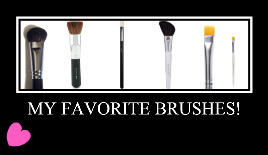 If you wear makeup then you have makeup brushes so this tip is for you! It’s important to keep your brushes clean b/c if you don’t icky stuff can end up on them & that’s GROSS! So try washing your brushes at least every 3 to 4 weeks. Use 1 to 2 drops of regular baby shampoo & warm water & wash. It’s that simple! Remember to let your brushes air dry! « No More Mineral Oil!